Jennifer L. Armentrout lives in West Virginia. All the rumors you?ve heard about her state aren?t true. Well, mostly. When she?s not hard at work writing, she spends her time reading, working out, watching zombie movies, and pretending to write. She shares her home with her husband, his K-9 partner named Diesel, and her hyper Jack Russell Loki. Armentrout writes Adult and Young Adult Urban Fantasy and Romance. She can be found ?brainstorming? on Twitter or stalking Goodreads while fighting her never-ending addiction to caffeine. Book Crush: Definitely Daemon. From beginning to end I was on love with him. I wouldn’t mind meeting a guy like him in real life. Even with the whole Alien part. Relate to Character: Katy. I can relate to her because I’m a huge bookworm and I’m not afraid to show it. 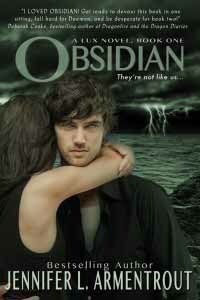 Favorite Part: Um duh when Katy and Daemon kissed each other for the first time. I’m mean steamy. Just wish it would have lasted longer. Any part that had Ash in it. I hated her. Change? : Take Ash out lol. But I guess if you did that then it wouldn’t be the same.